I’ve written here before a good amount about Prop 8 and marriage. I’ve talked about the hypocrisy of those that supported Prop 8, I’ve talked about the hatred, I’ve talked about my disappointment and I’ve talked about my personal experience. But I haven’t talked about what marriage is- it’s about two people in love who commit to each other- who vow to build a life together and support one another through good and bad. To know that, to paraphrase James Joyce in “The Dead”, when the see one another their “souls swoon slowly”. My partner of 20 years and I were married on the 26th of September 2008. 20 years ago to that date was when we told one another we loved each other. So it is September 26th that we chose as our anniversary and it was on that date 20 years later, while it was legal in California, that we chose to get married. 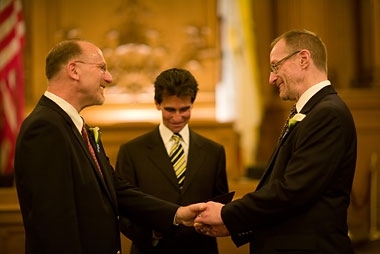 We got married in San Francisco City Hall’s Board of Supervisors Chamber in a ceremony officiated by California State Assemblyman Mark Leno surrounded by 20 friends and family. Our relationship has been strong for 20 years, longer than most straight relationships. We are committed to one anorther and deeply in love. Tell me- how is our relationship, our marriage and our lives together a threat to anyone. It is simply absurd. Tell me – do we look like a threat to you? We are two people who fell in love who both happen to be men.